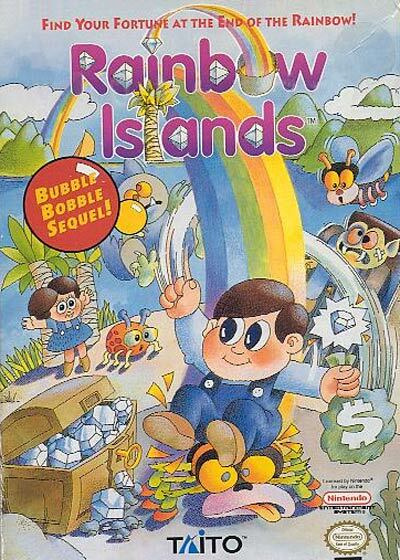 Rainbow Islands is a 1987 arcade game from Taito. The game is subtitled "The Story of Bubble Bobble 2" and is the sequel to Taito's hit game Bubble Bobble from the previous year. It became the second of four arcade games in the Bubble Bobble series (followed by Bubble Symphony and Bubble Memories). The game was ported for numerous home computers and game consoles. The basic premise of the game is that each level is an island which is slowly sinking into the sea. The player must therefore get to the top of each level, by jumping on platforms and making use of the game's most distinctive feature: the ability to produce solid rainbows, which are used both as platforms to stand on, and as a weapon. One of the features which sets this game apart from many others (and has no doubt been responsible for the game's popularity) is its 'hidden depths'. While initially appearing to be quite a simple game, Rainbow Islands in fact has a vast number of secrets for the player to discover, including secret levels, secret power-ups and riddles. Completing the game properly, therefore, requires a large amount of dedication from the player. The scoring system also has secrets, which allow vastly higher scores to be achieved than normal.